English troubadour David Gray, equipped with his acoustic guitar and a knack for writing both effervescent and chilled melodies, comes back at us with another collection of poignant pop. 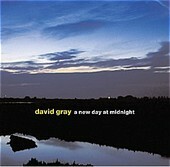 A New Day At Midnight, filled to the brim with luminous melodies and Gray's electronic-tingled sense of style, forges ahead with a new direction for the songsmith and his acoustic creations. With its steady motion and uplifting sense of dedication, A New Day At Midnight stands tall as a promising record that, at the end of the day, is always record to comfort you. I'll give it a B+.